Back in the good ole days, every serious rider rode on sew-up’s (tubular tires) because clincher tires were heavy and slow. So we also carried a spare tubular tire in case we got a flat by just strapping a spare under our saddles with a toe strap (it was also very easy to find an old toe strap clip-less pedals had not been invented yet). I still have a soft soft in my heart for this vintage look– along with the requisite Silca Impero frame fit pump. Modern technology seems so much less classy and elegant. Granted, the angle of my photo of my trusted Fizik bag On the other hand, the old-fashioned method of carrying a spare leaves the tire open to getting hit with a ton of road grime– particularly if you live in a rain-soaked place like Seattle. 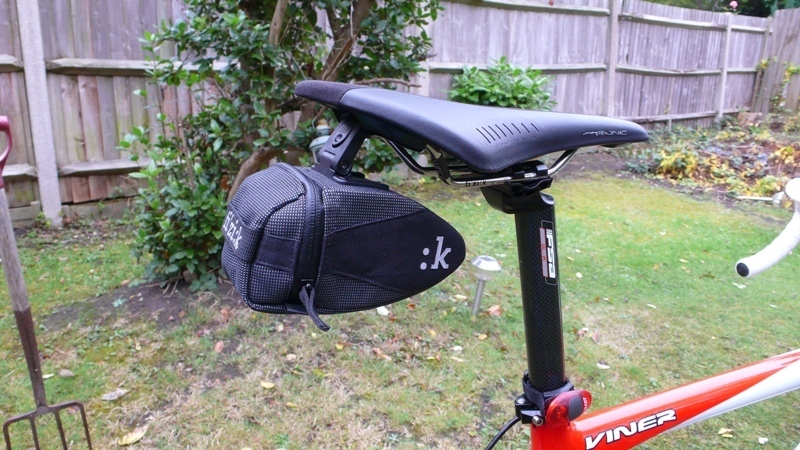 Unfortunately, the new saddle bags don’t offer a ton of room. And when you compare the massive size of a folded tubular tire with the diminutive size of a Fizik bag, it’s clear that the Fizik bag isn’t an option for you…. Unless, of course, you know about Tufo track tubulars. I first learned about this trick about a year ago when reading Tom Gerlach’s site. In turn, he credits Peter Reid with the idea. It is amazing to me how small a track tubular folds down. In the accompanying photo, I have a whole tire wrapped in shrink wrap that’s shrunk down to about the size of a butyl inner tube. In a jam, I can actually shoe horn TWO WHOLE TIRES in a medium size fizik saddle bag. You might think that these tires would pop in a heartbeat because they’re track tubulars. Not so. I’ve ridden probably at least 200 miles on them when I get a flat (I often train on tubulars). Also, Tufo tires work amazingly well with Tufo sealant. My buddy Ryan rides Tufo tubulars and swears he never has flats– he only replaces his tires when the fabric starts poking through the tread! Tufo tires don’t have a separate inner tube and some people think that it the rubbing between the tube and the tire that makes sealants less effective on tubular and clincher tires than with tubeless constructions like Tufos or tubeless clinchers (where the sealant market is particularly popular). There’s also something about the grittiness and tenacity of Tufo sealant that works really well with Tufo tires. Also, because it’s unsafe to go bombing corners or ride very aggressively with an unglued tire (because the tire may roll off the rim), my track spares look brand new even though they’ve been ridden on some pretty rough roads around here. Tufo track tubulars feel like they ride super fast. They are very narrow and take a high pressure easily. That narrow profile is great for a spare because it means that there is more room for error with the precious CO2 in your cylinder. It also means that you may feel every bump in the road. Despite the fast feel, I’ve heard that Tufos tend to have high rolling resistance. Some people say that that the lack of a separate tube inside means that there is a little more shearing force that causes the tires to resist conforming to the road surface as easily. I’m not sure about the science or the actual data about their road resistance. All I know is that I don’t feel any slower riding them. When I flat, I wrap my dead tubular around my aero bars and carry on. When I get home, I keep it around until I get at least one more dead tubular and then ship them off to Tire Alert down in Florida along with a set of nice light latex inner tubes. 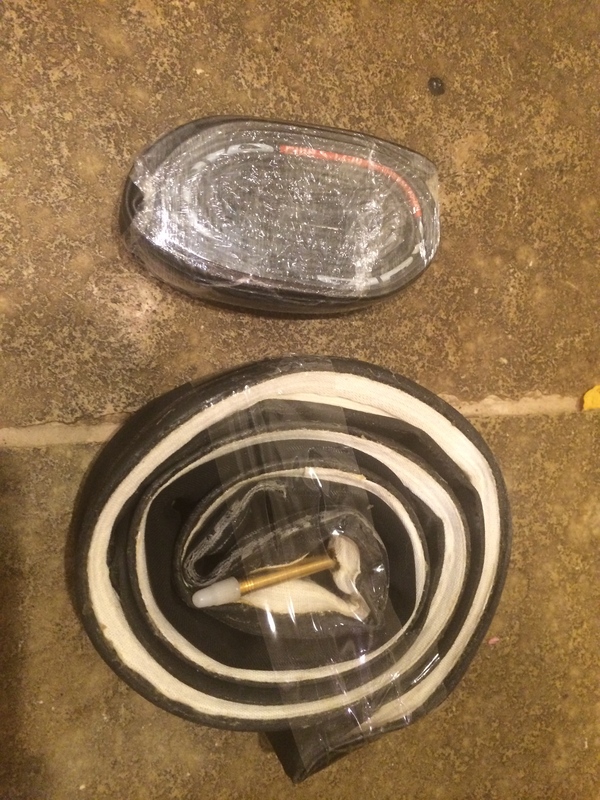 For $20 a tire, Ron Murawsky at Tire Alert will remove the base tape, undo the stitching, replace the tube, resew the stitching, replace the base tape, and send it back to you by Priority Mail. I don’t know how he does it that inexpensively, but I’m sure glad he does. The biggest complaint about tubulars is that they are expensive. Sure, tubulars are super pricy (the Veloflex Carbon and Arenberg tires I ride are over $100 each), but with Tire Alert, each flat only costs about $20 more than a similar flat with a clincher tire. With Tire Alert, I can usually make it through the season with just one new set of tires that I rotate with older tires. Safer. If you get a flat on a downhill, it’s easier to control the bike if you’re riding tubulars. With clinchers, the only thing holding the tire on the rim is the combined effect of the bead and air pressure– remove the air pressure and the tire gets very unstable on the rim. With tubulars, the tire is always glued to the rim and, even with a flat, it’s not going anywhere. Fewer Flats. I don’t have any empirical evidence to back this up, but I just seem to get more flats with clinchers. Also, most people say that sealant works better in tubulars than in clinchers. If the goal is not to get a flat in the first instance, tubulars put the odds in your favor. Less Risk After You Have a Flat. Ever get a pinch flat with a clincher? 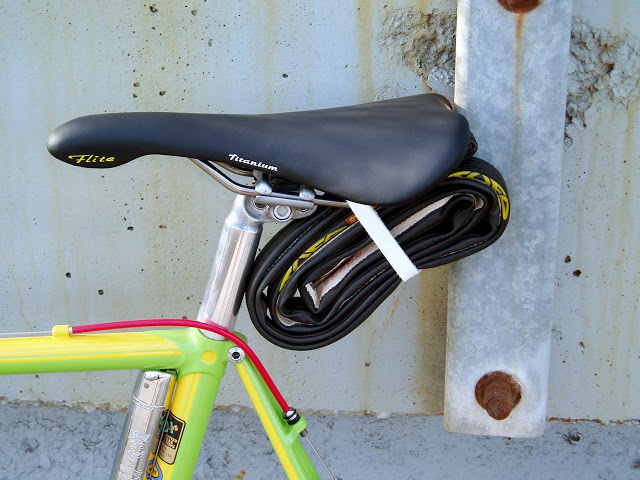 It’s impossible with a tubular because you can’t get the tube caught anywhere. Also, what if you get a big gash in the casing of your clincher? In case you ride with a whole spare tire, your race is done. All of these reasons make tubulars the tire of choice for me (particularly because I’m an old guy who grew up with them). But there are a few things I bear constantly in mind riding tubulars. Careful with Turns After a Flat. I remember riding behind a guy in college who rolled a tubular. I almost had a heart attack. Not something I’ll ever forget, so I never take a turn fast after changing out a tubular. A loss of a few seconds beats going down any day. If I were racing a road race or doing a draft legal race, getting dropped is death and I’d probably opt for clinchers instead. Always Carry a Spare Regular Tire and Glue to a Race. If I’m going out of town for a race, I always bring along a spare tire and some glue– just in case. Weird accidents happen, Or I might always flat in a pre-race warmup. This possibility makes me think that clinchers are the better alternative for big international races or training camps where I’m going to be away from home for days on end. I can always a tube locally but I might not be able to get a tubular tire easily. So there you have it– tubulars win hands down for me except for (1) races where I have to ride very aggressively after a flat and (2) “big travel” races (long or international trips). At least that’s my thinking. I picked up some pretty decently priced used Zipp tires not realizing the lower price was because the were tubulars. Ryan walked me through the whole deal and got me set up with Tofu and haven’t looked back. I was a bit nervous going in to Penticton, but do have to say totally loved them and even much more after flatting and repairing. Great article. Thanks for posting. Yup, Tufo’s are amazingly bulletproof. I assume Ryan set you up with the Tufo sealant as well.